This piece appeared on Sunday, and it’s not up to the usual standard, I feel. The dark space below the cherubs is messy and I wonder if it covers something that went wrong. 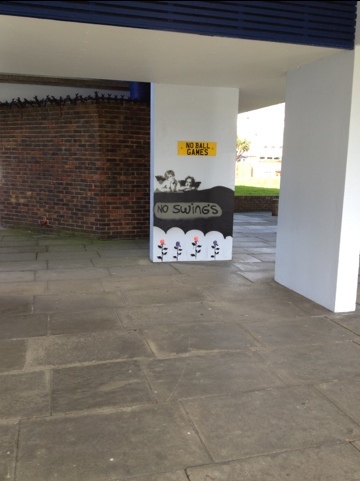 It also contains a grocer’s apostrophe so while the link between ‘no ball games’ and ‘no swings’ is fun the execution leaves something to be desired. Meanwhile, Trust Thamesmead is on the case asking “Who is the Thamesmead Banksy?” It doesn’t make much of an attempt to identify the artist, but does link to a PDF containing several photographs of pictures I’d not seen to date. This entry was posted in about the area, oddities and tagged art, graffiti. Bookmark the permalink.